Go beyond gluten-free zucchini muffins by including fruit! 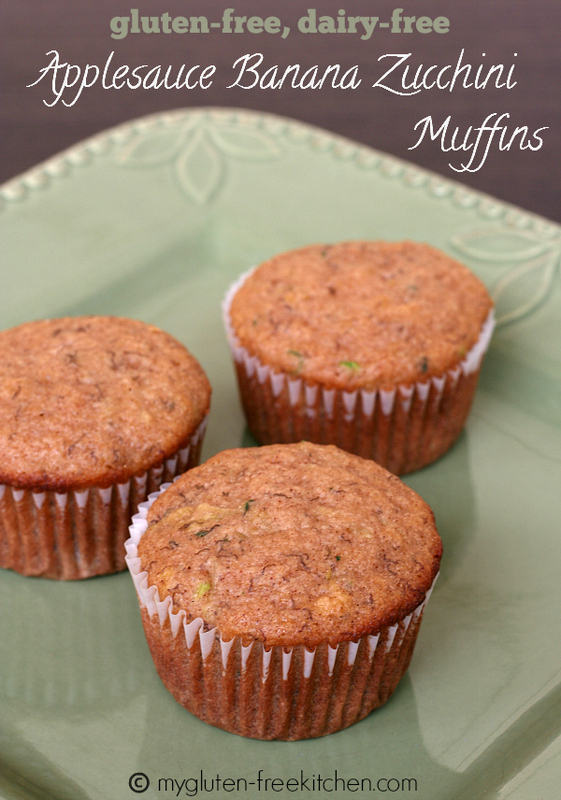 You’ll love these freezer-friendly gluten-free, dairy-free applesauce banana zucchini muffins! What do you make when you have overripe bananas AND your neighbor brings by a bunch of zucchini? That’s what I was wondering! Since my kids love muffins, I decided to see about combining these to make a healthy-ish muffin. I decided to add applesauce too, as it adds more Vitamin C and using it allows me to use less butter or oil as well. 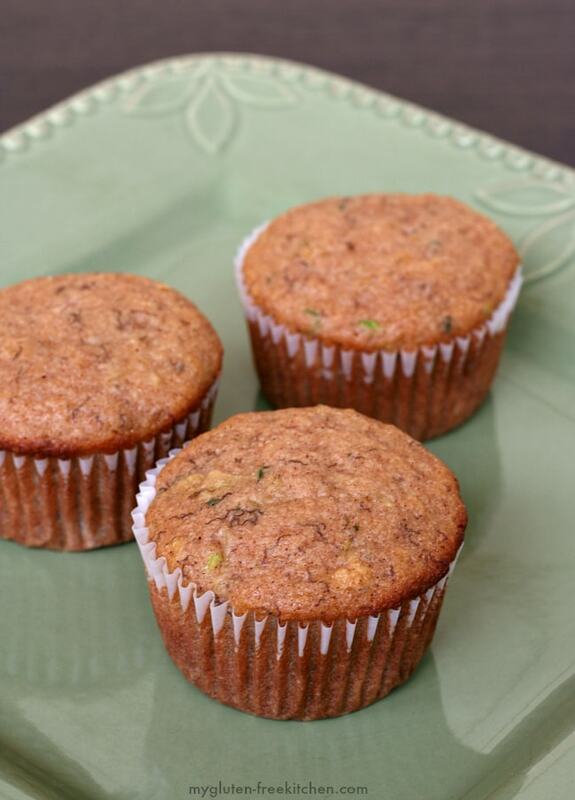 I was able to combine applesauce, bananas, and shredded zucchini together in these delicious gluten-free muffins that my family happily devoured! I’m always looking for new recipes to use up zucchini from our garden and our neighbor’s gardens. When I have a huge zucchini to use up, I pull out my food processor, put on the shredding blade (the one you use for shredding a bunch of cheese) and shred up the whole big zucchini, skin and all. (Not that I do remove the inner seed layer.) This weekend, we did that with two huge zucchini that my neighbor dropped by. I was able to make two batches of these applesauce banana zucchini muffins, one batch of our favorite gluten-free zucchini cake brownies, and froze the remaining zucchini in 1 1/2 to 2 cup portions in freezer bags for future baking. You could definitely pack even more nutrition into these by adding in some ground flaxseed, in fact I’m going to do that next time! We’re firmly in the no nuts in muffins camp, but if you like nuts, feel free to mix in 1/2-3/4 cup or so or your favorite nuts (pecans would be good), stirring them in at the end of the mixing process. These muffins freeze well too. I froze some and am pulling them out to send as part of my boys’ lunches. Quick and easy! What is your favorite way to use up zucchini? Line 2 cupcake/muffin pans with paper liners or spray with non-stick cooking spray. In a small bowl, whisk together flour, xanthan gum, salt, baking powder, baking soda, and cinnamon. Set aside. In a mixing bowl, beat together melted butter, applesauce, mashed banana, eggs, sugar and brown sugar for 1 minute on low speed. Scrape down sides of bowl and beat on low another 20 seconds. Add dry ingredients to wet ingredients. Mix on low speed just until mixed. Add shredded zucchini, mix just until combined. Use a large scoop to fill paper lined muffin tin cups 3/4 full. Bake at 350° for 15 minutes or until muffins are set and a toothpick inserted in center comes out with moist crumbs attached. Cool in pan 5 minutes, then remove to wire rack to cool completely. Once cooled, store in airtight container at room temperature or stack in freezer bag and place in your freezer to enjoy later! *I tested this with Gluten Free Mama's Almond Flour Blend. Me too Shirley! So glad it worked out well to combine the three. I just shredded and froze a bunch of zucchini so that I can make more throughout the winter! I cannot have eggs. What would you suggest to replace the eggs? I think the flaxseed/water replacement would work well here. Have you tried that in your baking before? I’ve been making these for a few years and the whole family loves them for breakfast. I think the coconut oil adds to the flavor profile a bit too. I don’t use the xanthan gum however. Thanks Sandy. My family loved them too! I agree with you that the coconut oil works really well in these! I’m going to try them without xanthan gum next time. With the banana helping bind, it might just not be needed. It’s so not zucchini season here yet (we have a late frost as I write) so what could I substitute? Carrots? Anything else? Thank you for sharing! If you can’t find any summer squash, you could definitely try finely shredded carrots. I haven’t tried that, so I can’t guarantee. Please do let me know if you try! These look great and so easy! Thanks for linking up at our Gluten Free Fridays party! I have tweeted and pinned your entry to our Gluten Free Fridays board on Pinterest! 🙂 I can’t wait to see what you share this week! Its LIVE! can this be made into a 8×13 cake? dairy as well as the butter but it sounds so yummy. I will definitely try these. love texture so I will ad some walnuts maybe even drizzle some cream cheese frosting. I invest in freeze dried foods and would love to try this recipe using the fruit. Thank you for sharing I can taste them now. Hmm! Judith, eggs are not a dairy product. Some people get confused because they are sold in the “Dairy” section of the grocery store, but they are not a dairy product. You can google it if you are doubting. The butter is listed as an alternative to oil for those that can have dairy and want to use it. But yes, this recipe is definitely dairy-free as written. Hope you can make this soon and love them too! I made these for breakfast and they are delicious! I used Mama’s Almond Flour Mix and coconut oil. I added pecans in half and chocolate chips in half. Very easy to make and so yummy! Thanks for the recipe. can I use canola oil or Smart Balance butter alternative to coconut oil? my son has allergies to coconut and butter.